The battle for control of the 4 Spinjitzu weapons has begun! Help Sensei Wu, Zane and Nya to stop Lord Garmadon and his evil skeleton army from taking the ultimate Spinjitzu weapon, the dragon sword of fire. Split the temple in half to release the Fire Dragon, and use it to protect the sword by spitting fire balls at Lord Garmadon! Now if you're at this point as lost as a Samurai in Staines, here's a hint - watch the animated video below which explains everything! Or, here's a quick summary if you haven't got 11 minutes to watch the video. 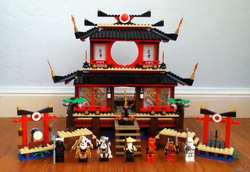 Kai the blacksmith is happy making swords until evil Lord Garmadon's skeleton army kidnap his sister and steal a map marking the secret hiding places of four mighty weapons, guarded by dragons. Kai learns to fight under Spinjitzu Master Sensei Wu, but it's only when he teams up with three other ninjas to recover the first weapon that his Spinjitzu powers are released. Like this top Christmas toy, but lost the plot? How about the Lego City Police Station instead?